I thought I’d give a visual progress report of my hair growth. Here’s a picture I took today. You can compare it to one I took on October 13, 2007. Kind of weird, huh? And, not too attractive. 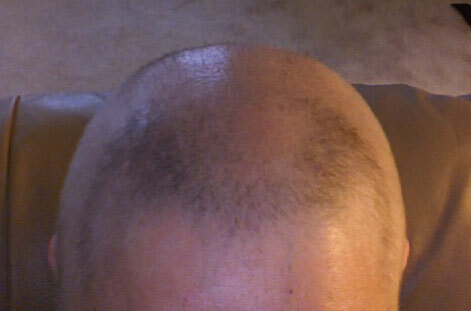 My hair started to fall out in September, after I had high dose chemo (melphalan) on August 28th. Some spots still look bald, even though there’s a covering of very fine, nearly invisible hair. I had a follow up appointment at Duke today. I won’t have any results until Wednesday afternoon. Not anything important, anyway. I didn’t even bother getting a copy of my CBCs. Dr. Long just told me they were completely normal. Throughout my entire MM experience, my CBC’s have hardly ever been anything but normal. My hair is a bit ahead of yours — I’m starting to get a nice fur coverage. Am having fun with hats and they’re needed now. I am a little disappointed though that my hair seems to be coming in rather grey. It will be interesting to see how it develops. You are so brave.. And it must be exciting to see that .. indeed!… It WILL come back. Best Wishes.